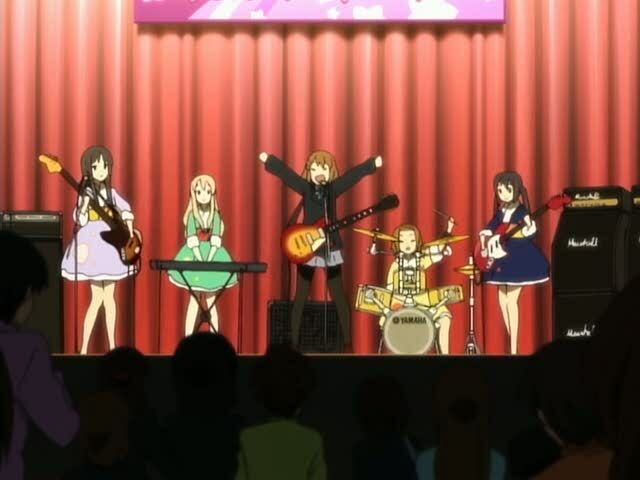 K-ON is one of those animes that gives you an insight into an ambition. In this case it would be A group of 4 school girls (later 5) who aspire to play to a huge crowd. The Main Protagonist features Yui Hirasawa a friendly airhead who has been entered into Sakurakou Highschool, the other characters (Mio Akiyama, Ritsu Tainaka and Tsumugi Kotobuki) have already met and have decided to start a "music Club" but they need four members to make the club offical. Yui Stumbles in hoping to be able to play the castanets, but the rest of the club gather together to teacher her guitar. I came across this anime while watching the opening.... and within the first 10 minuites i was hooked on it! the storyline's not tragic and full of love triangles, its really relaxing to watch and it really helps brighten up your day. I dunno.... if you guys get that "Gutted" feeling after watching a really good anime thats ended... i got that like 5x worse . I Highly reccomend this Anime to anyone, its Inspirational, Heart Warming, the reason i started to play guitar . The Soundtracks are awesome, the character songs are Awesome, the Opening and Endings are.... you guessed it AWESOME!! !